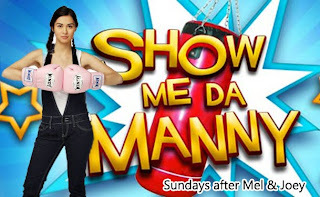 The most viewed TV soap opera comedy is Show Me the Manny, Marian Rivera's partner is no other than a world boxing champion Manny "Pacman" Pacquiao. Marian as Ella,you can see here how Marian really acted as a comedian, she really let your Sunday evening a happy even enjoyable one. Show Me the Manny starts 9:30 to 10:30, after Mel and Joey at GMA 7 (Philippine TV network).Laughter is the best medicine to avoid wrinkles, just watch Show Me the Manny.